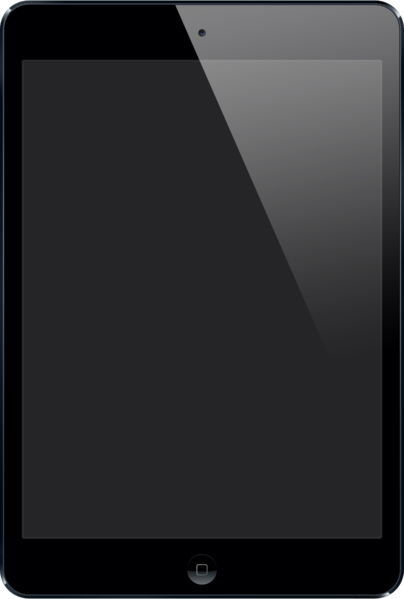 The iPad Mini (stylized and marketed as iPad mini) is a mini tablet computer designed, developed, and marketed by Apple Inc. It was announced on October 23, 2012, as the fifth major product in the iPad line and the first to feature a reduced screen size of 7.9 inches, in contrast to the standard 9.7 inches. It features similar internal specifications as the iPad 2, including its display resolution. It was released on November 2, 2012 in nearly all of Apple's markets. The iPad Mini shipped with iOS 6.0.1. It can act as a hotspot with some carriers, sharing its Internet connection over Wi-Fi, Bluetooth, or USB, and also access the App Store, a digital application distribution platform for iOS that is developed and maintained by Apple. The service allows users to browse and download applications from the iTunes Store that were developed with Xcode and the iOS SDK and were published through Apple. From the App Store, GarageBand, iMovie, iPhoto, and the iWork apps (Pages, Keynote, and Numbers) are available. The iPad Mini comes with several pre-installed applications, including Siri, Safari, Mail, Photos, Video, Music, iTunes, App Store, Maps, Notes, Calendar, Game Center, Photo Booth, and Contacts. Like all iOS devices, the iPad can sync content and other data with a Mac or PC using iTunes, although iOS 5 and later can be managed and backed up with iCloud. Although the tablet is not designed to make telephone calls over a cellular network, users can use a headset or the built-in speaker and microphone and place phone calls over Wi-Fi or cellular using a VoIP application, such as Skype. The device has dictation, using the same voice recognition technology as the iPhone 4S. The user speaks and the iPad types what they say on the screen provided that the iPad is connected to a Wi-Fi or cellular network. The device has an optional iBooks application, which displays books and other ePub-format content downloaded from the iBookstore. Several major book publishers including Penguin Books, HarperCollins, Simon & Schuster and Macmillan have committed to publishing books for the device. Despite being a direct competitor to both the Amazon Kindle and Barnes & Noble Nook, both Amazon.com and Barnes & Noble offer e-reader apps for the iPad.